Frequent discussions of Satan from the pulpit, in the courtroom, in print, in self-writings, and on the streets rendered the Devil an immediate and assumed presence in early modern Scotland. For some, especially those engaged in political struggle, this produced a unifying effect by providing a proximate enemy for communities to rally around. For others, the Reformed Protestant emphasis on the relationship between sin and Satan caused them to suspect, much to their horror, that their own depraved hearts placed them in league with the Devil. 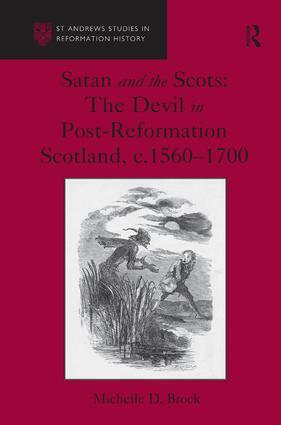 Exploring what it meant to live in a world in which Satan’s presence was believed to be, and indeed, perceived to be, ubiquitous, this book recreates the role of the Devil in the mental worlds of the Scottish people from the Reformation through the early eighteenth century. In so doing it is both the first history of the Devil in Scotland and a case study of the profound ways that beliefs about evil can change lives and shape whole societies. Building upon recent scholarship on demonology and witchcraft, this study contributes to and advances this body of literature in three important ways. First, it moves beyond establishing what people believed about the Devil to explore what these beliefs actually did- how they shaped the piety, politics, lived experiences, and identities of Scots from across the social spectrum. Second, while many previous studies of the Devil remain confined to national borders, this project situates Scottish demonic belief within the confluence of British, Atlantic, and European religious thought. Third, this book engages with long-running debates about Protestantism and the ’disenchantment of the world’, suggesting that Reformed theology, through its dogged emphasis on human depravity, eroded any rigid divide between the supernatural evil of Satan and the natural wickedness of men and women. This erosion was borne out not only in pages of treatises and sermons, but in the lives of Scots of all sorts. Ultimately, this study suggests that post-Reformation beliefs about the Devil profoundly influenced the experiences and identities of the Scottish people through the creation of a shared cultural conversation about evil and human nature. "Satan and the Scots is an impressive and ambitious book; a book that, in its sheer scale, firmly cements the relationship between belief in the Devil and the past lived experiences of early modern people. All scholars of early modern religious thought, including witchcraft, should consider reading this book with care. Postgraduates will find it deeply inspiring for their own research, and undergraduates will find it a useful introduction to many early modern religious topics, including, but not limited to, the Scottish Reformation; witchcraft; and demonology." Introduction; Reforming the devil; From the pulpit; A constant adversary; Internalizing the demonic; Wicked words and demonic belief; The devil as master; Satan on the streets; Conclusion: of monsters and men; Bibliography; Index. Michelle D. Brock is an Assistant Professor of History at Washington and Lee University, where she teaches courses on British and early modern European history. She received her Ph.D from the University of Texas at Austin.